Guest Comic By George Ford – DairyBoy Comics! 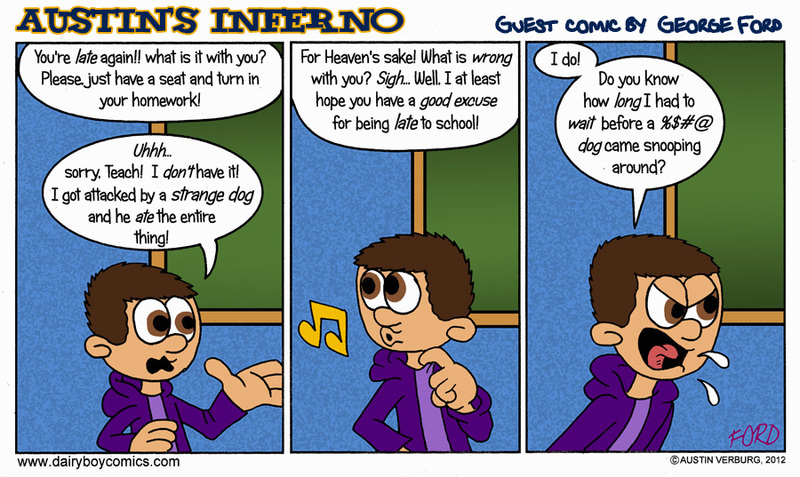 Today’s guest strip is brought to you by George Ford! George does the daily web-comic strip “Addanac City”, which is about a rowdy trouble maker of a seven-year-old named Hank who lives for causing mischief at the expense of his friends, family and other authority figures! George’s comic may be read HERE, and you can check out his facebook page HERE and his twitter page HERE! So he did his homework and fed it to a dog? I like your style kid. Yeah, he did his homework then he waited for the dog to eat it. That is like the guy who carried around a small bottle of whiskey in case of snakebite…he also carried around a small snake.